Ray Lovato is an award winning Santo Domingo artist who is well known for his handmade heishi beads. Ray began learning the art form from his parents at the age of 11. Soon thereafter he began winning recognition and awards at the Santa Fe Indian Market, and has been in many publications. At the age of 18, Ray enlisted in the army and served three tours in Vietnam, where he was exposed to Agent Orange. When he returned to the village in 1970 he began to make jewelry, as he was unable to drive to work in Albuquerque. At this time, the machine lapidary work was becoming more popular and treated--or stabilized--turquoise was being used by most artists because it was easier to work and less expensive to buy. Ray was a traditionalist and decided not to follow that trend. For the past 40 years his work has been considered the finest natural, hand-ground turquoise heishi jewelry. 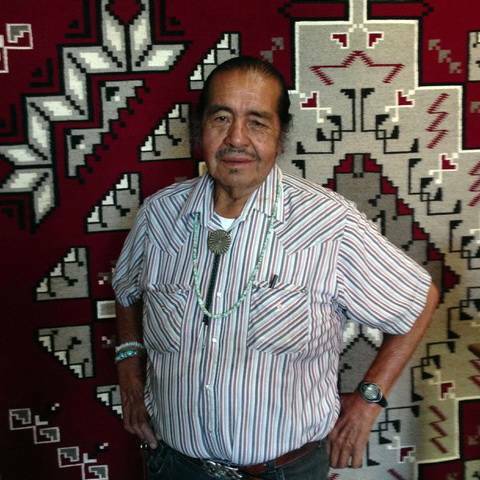 He has a wall full of awards at the Santa Fe Indian Market and still prides himself on carrying on the tribal tradition. He is one of the few still working with the old tools and original materials. Ray has also served terms on the Santo Domingo Council and is considered an elder worth listening to. He participates in all village ceremonies and dances, and has raised his children to respect their traditions. Ray always arrives at the gallery with several family members in tow and always bearing gifts of home made Puebloan style bread and a big smile on his face. We are honored to work with Mr. Lovato and to represent his fine hand turned Heishi turquoise.